In a rather irrational tirade “I support of open public debate“, Stephen Mayne, votes to gag debate and deny a review on a very important topical issue. This was the first time Stephen Maybe had opportunity in a Council public forum to talk on bikes and bike lanes specifically, yet he would not allow discussion on the merits of the design or its implementation, preferring instead to vote against a rational motion put forward my Councillors Richard Foster seeking to hold a review of Melbourne’s Bike Lanes following the end of the Princes Bridge Trial in September. What does Councillor Mayne and the Lord Mayor Robert Doyle fear? Are they afraid to air Council’s dirty linen and allow public discussion on the merit of the designs and decisions made? This is not about bikes per-say it is about the design and implementation of the segmented bike lanes and the prudent use of Council’s financial resources. Latrobe Street Cost $2.6 Million. 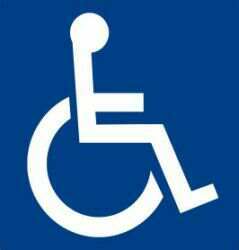 It does not work..Wrong design wrong location bad implementation. The alternative “Claredon Street” Bike Lane design should have been considered. It is cheaper and better. Council must explain its position and failure to adopt this design. This was the first time Stephen Maybe had opportunity in a Council public forum to talk on bikes and bike lanes specifically, yet he would not allow discussion on the merits of the design or its implementation, preferring instead to vote against a rational motion put forward my Councillors Richard Foster seeking to hold a reviw of Melbourne’s Bike Lanes following the end of the Princes Bridge Trial in September. What does Coucnillr Mayne and the Lord Mayor Robert Doyle fear? Are they afraid to air Council’s dirty linen and allow public discussion on the merit of the designs and decisions made? Councillor Richard Foster seeking to provide the review that Doyle rejected. 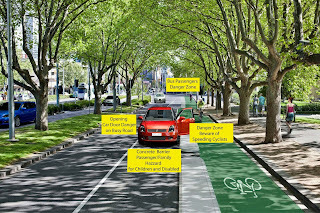 City of Melbourne’s ill-considered $330k St Kilda Lane Bicycle Lane will trade off pedestrian and motorist safety for a marginal gain in cyclist safety. Melbourne City Council plans to install a 300 metre section of St Kilda Road Separated bike path against the advice of its own engineers. The bike separation design is similar to the design of the LaTrobe Street bike lane that was installed last month. The proposed lane design will force motorists to park on the outside of the bike lane 3 meters from the footpath creating a major risk to pedestrian and motorist safety. The proposed “island of danger” separation barrier will be installed in the south bound location between Princes Bridge and Linlithgow Avenue south of the Floral Clock. Beyond Linlithgow Avenue the bike lane will revert back into the standard bike lane design adding to confusion and road safety concerns. Melbourne City Council Traffic Engineers prefer to install a line-marked lane only without the inside dangerous separation barrier but have been overridden by Engineering Services Manager Geoff Robertson. City Council Traffic Engineers sight the successful design of the Claredon Street East Melbourne bike lane where the width of the bike lane is such that bikes travel outside of the car door opening zone. A line painted only bike lane is significantly cheaper than teh ocst of a physical lane separation and would allow the Council to extend the lane beyond Linlithgow Avenue, It also allows emergency vehicles unimpeded access. Melbourne City Council is under fire over it implementation of its Bicycle Network. The $2.6 Million Latrobe Street experiment is considered to be a complete disaster with the Council now having to remove on-street car parking which has since been found to be unsafe. The current City Council has never considered or approved the proposed design in open committee. Stakeholders have been denied the opportunity to have their concerns heard. Councillor Richard Foster has expressed concern and opposition to the St Kilda Rd development by has been railroad by the Greens and the Lord Mayor Robert Doyle into remaining silent. Councillor Foster wants the development referred to open Council Committee to allow Council to consider the opinions of all stakeholders and the pros and cons of the various designs. Melbourne Bus and taxi operators have expressed concern about the safety of its passengers if the Melbourne City Council’s proposed St Kilda Road Bike Lane development is allowed to proceed. 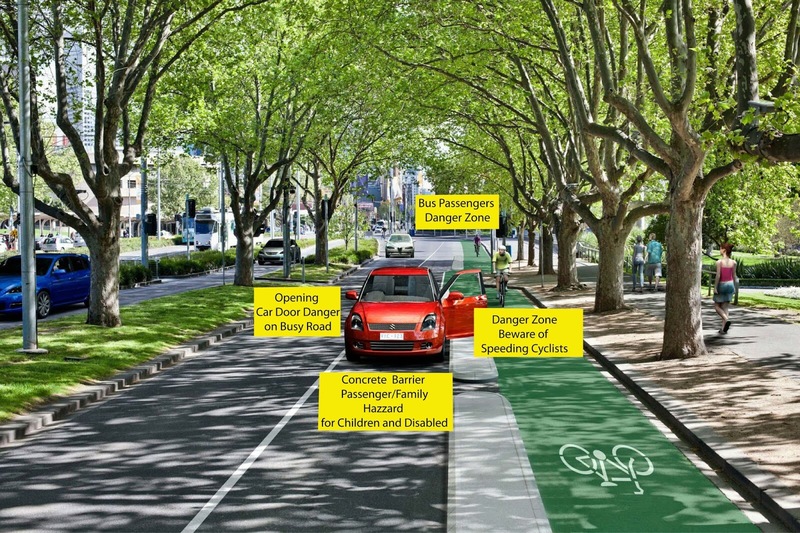 The proposed design is a serious threat to the safety of passengers exiting the bus with passengers having step onto the 1 metre stone separation barrier, then wait to ensure there are no bicycles bearing down on them before crossing the 3 metre bike path on to the adjacent footpath. The situation is worst when there are 40 other passengers all wanting to exit the bus at the same time and would even worst again in an emergency situation. Bus and taxi drivers are joining the chorus of other community groups opposed to the proposed $330,000 bike plan design which is scheduled to be installed next month. Residents, business and community groups are calling on the City Council to scrap the plan and hold am open public review of the proposal. Community advocate and former City Councillor David Nolte has said that Cr Richard Foster has expressed concern at the proposal and t bis understood he has asked that the matter be brought before Council. Other Councillors have also expressed concern but said that the issue was in the hands of the Lord Mayor Robert Doyle who was opposed to any review in spite growing concern over its impact on public safety. Cr Stephen Mayne, who claims to be an advocate for open and transparent government, was not prepared to discuss this issue. Serious concern that that the City of Melbourne Lord Mayor, Robert Doyle and City of Melbourne Director of Planning Geoff Lawler has mislead the public in response to proposed changes to Melbourne Planning Scheme to be introduced on July 1. Mr Lawler who failed to present a written report outlining the effect of proposed changes to the planning scheme has compromised the City of Melbourne in the process. Under the revised planing scheme to be introduced on July 1as amended by the Minister for Planning, Matthew Guy, Gaming venues will not longer require a planning permit in the new Commercial 1 zone and will becomes an “as of right use” opening up the possible proliferation of gaming venues adjacent to residential precincts. Gaming venues come under the definition of Retail premises as defined under the the Victorian Planning Scheme. Self appointed anti gambling advocate and Deputy Chairman of the Melbourne City Councils planning portfolio were oblivious to the impact of the proposed changes. Councillor Mayne had previously given an undertaking to review the matter and present a report in June but to date has failed to fulfill this undertaking. When asked where and when a report on impact of the the proposed changes will be presented to Council Lord Mayor, Robert Doyle rejected to notion or suggestion that the Council had given an undertaking to table a written report. Director of Planning Geoff Lawler, sought to deflected criticism of the Council not being informed or advising the public of the impact of the proposed changes. It is understood that this issue was discussed in an unreported closed session Councillor forum. 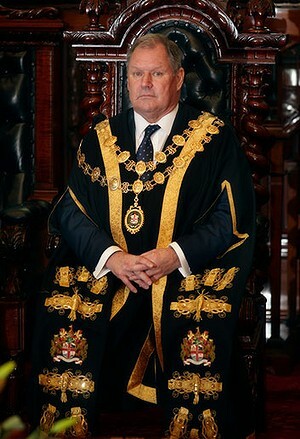 In response to a question raised by Anthony van der Craats, the Lord Mayor, Robert Doyle advised that as per the previous discussion regarding the zoning changes at the beginning of the meeting the matter will be brought before Council, but cannot guarantee it will be at the June Council meeting. The CFMEU (Construction Forestry Mining Employees Union) and Victoria’s Trade Unions will be marching next Tuesday April 30 in support of Safety on Melbourne’s Building sites. The march begins at Trades Hall in Victoria Street, and will proceed to the Swanston Street site of last month’s tragedy for a minute’s silence as a sign of respect.outside the GroCon CUB building site on Swanston Street. The City of Melbourne still has not provided information why it had not issued a permit or inspected the building site hoarding which collapsed on March 28.killing three innocent pedestrians. Councillor Stephen Mayne, Chairman of the Council’s Finance and Governance portfolio, was unable to answer questions from the public last week if the City of Melbourne had issued a permit for the new hoarding or if it had inspected the site and if not why not? 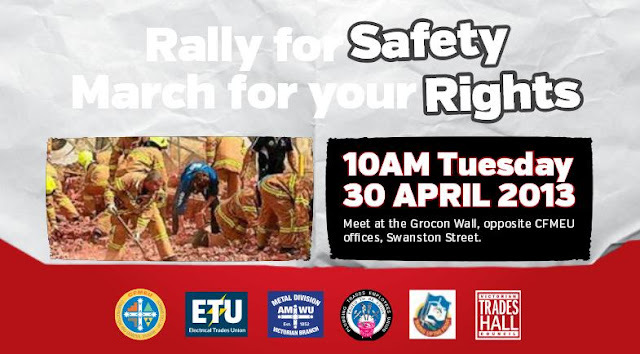 The CFMEU (Construction Forestry Mining Employees Union) and Victoria’s Trade Unions will be marching next Tuesday April 30 in support of Safety on Melbourne’s Building sites. The march will start at 10AM outside the GroCon CUB building site on Swanston Street. Questions remain unanswered following last months fatal wall collapse with the City of Melbourne ducking for cover and in lock down mode avoiding responsibility. According to a City of Melbourne spokesperson a permit is required for the construction of a hoarding on a building site. The City of Melbourne in its statement published on April 9 stated that a permit was not issued for a hoarding on the GroCon Swanston Street building site that collapsed on March 28 killing three pedestrians. When asked on April 16 if the Council had issued a permit for the NEW hoarding on thee GroCon Swanston Street site and if the Council Officers had inspected the site and if not why not? Councillor Stephen Mayne, Chairman of the Council’s Governance portfolio was unable to answer and took the question on notice. A week has passed and still the City of Melbourne has not been able to respond to this important and yet simple question. Questions are being asked if the Council is guilty of contributory negligence for the death of three innocent people by failing to fulfill its statutory obligations and/or if Council staff had received inducements to turn a blind eye to the requirement to issue a permit for the construction of a hoarding? Both the new and old hoardings were taller then the maximum height of 2.4m listed in the Council’s Construction Management Plan guidelines. It is a simple question and deserves an answer. Council itself, and Councillor Mayne in particular, are now being compromised by the Council’s failing to reply. Avoiding the question will not make it go away and only serves to undermine public confidence in the City Council’s Administration. 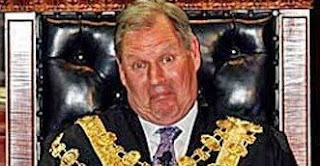 The Lord Mayor, Robert Doyle, may also be tainted by the Council’s lack of response with allegations being made that Councillor Doyle is actively seeking to block twitter discussion and review of his administration. The Melbourne’s City Council’s denial and side shifting gets shiftier every day. Not only did the City Council declare the minutes of its meetings to be a true and accurate record of its meeting, when they were not, the City Council today issued a statement that the “Structure” attached to the brick wall that collapsed killing three innocent victims was neither an advertising sign or a hoarding and that no permit had been issued for the structure attached to the collapsed wall or the site inspected. Not only did the City Council fail to ensure that the required permits were issued and that the building and building works on on the site complied with the public safety standards, it also failed to inspect the site for compliance with Melbourne’s local laws. The question must be asked was the Council negligent in fulling its statutory duty and prime responsibility to ensure and protect public safety? The Council, as claimed in its statement, has tried to shift the blame and responsibility for the building site management off to the State Minister for Planning, Matthew Guy, who issued a planning permit for the site and as such the City Council was not responsible for the construction site approvals. The planning permit is different to the building and construction permit. “There are intricacies in the way in which these (laws) interconnect and overlap,” the council said in a statement on Tuesday. The City Council still has a statutory obligation to ensure that building sites are constructed according to standards and that public safety is maintained. The responsibility for compliance and enforcement still remains with the City of Melbourne. A team of engineers and inspectors and not one inspection had been made since the 3m high Grocon hoarding was constructed over a year ago. Had the City Council inspected the site it could have identified the breaches in the building code and should have picked up the fact that the hoarding/fence/structure was taller than the permitted hoarding height of between 1.8 to 2.5 metres. Three innocent members of the public may still be alive today. Of course anyone who dares question the Council’s involvement or responsibility for oversight of the building site, which is subject to investigation by the Coroner, Work Safe and the Building Commission, is grandstanding as claimed by Melbourne City Councillor, Stephen Mayne, Chairman of the Council’s Governance portfolio and Deputy Chairman of Planning. The City of Melbourne requires developers and builders to carefully manage excavation, demolition and building works within its municipal boundaries. To achieve this, builders and developers are required to submit a construction management plan that takes into account all relevant aspects of demolition or building work. A permit is required to be issued prior to the construction of a hoarding or fence within the municipality under the Municipal Local Law. A permit for a hoarding last for one year and is subject for inspection by the City Council. Hoarding screens must be constructed of closely boarded timber or plywood between 1.8m to 2.4m in height to secure a building site and form a barrier against noise, dust and debris. Chain wire and corrugated iron fences are considered unsuitable for this purpose. Hoardings are to be designed to withstand wind loads to AS 1170.2 with counterweights as necessary to prevent overturning. In addition hoardings adjoining excavations are to be designed to withstand a lateral line load of 0.75 kN/m applied at a height of 1 metre from the base and suitably guarded by barriers to prevent vehicular impact.